5 Bedroom Detached House For Sale in Hook for Guide Price £1,375,000. Baileys Farmhouse is an attractive Grade II Listed property dating back to the 17th century with later additions. An abundance of charm and character can be found throughout the cottage with exposed beams, timbers and brickwork, open fireplaces, an old brick bread oven, cleverly used for additional storage or wine cooling and traditional style wooden latch doors. The spacious dual aspect living room features a lovely Inglenook fireplace with slate hearth and numerous exposed timbers. The bespoke kitchen/breakfast room has a good range of painted units under black granite work surfaces, a four oven oil Aga and a number of integrated appliances including a fridge and dishwasher. For more formal entertaining there is a separate dining room benefitting from original parquet flooring which continues through into the adjacent family room benefitting from a brick fireplace with a Calor gas fire. For the homeworker there is study boasting French doors and views into the gardens and fields beyond. A door from the study gives access to the utility room. A downstairs w/c with a range of built in storage can also be found on the ground floor. The first floor is of equal merit; the principal bedroom suite is of a good size and benefits from a fully fitted dressing room and a large en suite bathroom with a separate shower cubicle and a Jacuzzi bath. The second bedroom has a lovely vaulted ceiling and a range of built in wardrobes. There are a further two double bedrooms both with built in wardrobe and a single bedroom which was previously used as a study, which are served by the separate family bathroom. Overall Baileys Farmhouse is a fine family home and an early viewing is highly recommended. Odiham High Street 2 miles, Hook 4 miles, Basingstoke 9 miles, Farnham 8.5 miles, Alton 12 miles, mainline rail stations at Winchfield 1 mile and Hook 4 miles, M3 (Junction 5) 3 miles. 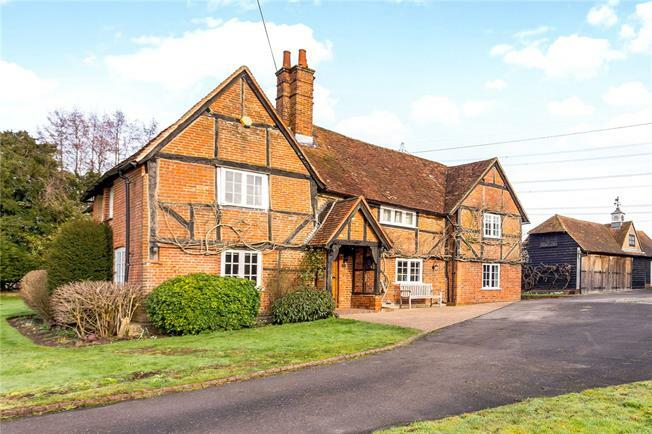 Baileys Farmhouse is approached via a long private shared driveway leading to a five bar gate giving access to the driveway providing plenty of parking. There is a large detached barn style double garage with garden store, store and workshop attached. The majority of the gardens are to the side and rear of the cottage and are mainly laid to lawn with numerous mature trees and shrubs. To the immediate rear of the property there is a flagstone terrace with a pergola which sweeps round to a further side terrace with a brick retaining wall and steps leading up to the lawn. There is a circular pavilion with lovely views over the garden and adjoining fields and an old brick World War II pill box. In one corner of the garden there is a tennis court which is in need of attention and updating. In total there is about 3 acres of garden and grounds.